This is a single zone alarm - with independently adjustable Exit, Entry and Siren Cut-Off timers. It will accommodate the usual types of normally-closed input devices - such as magnetic-reed contacts, foil tape and PIRs. When the alarm is activated - the Siren will sound for up to 20-minutes. Then it will switch off - and remain off. The alarm will not re-activate. If you wish - you can use a mains power supply. But the extremely low standby current makes battery power a realistic option. 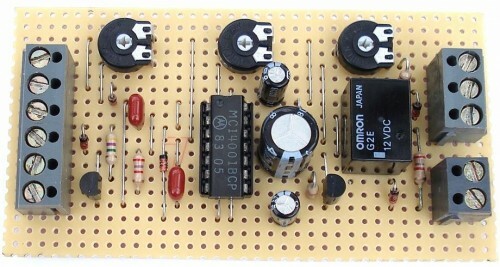 I've used a 9-volt supply in the drawing - but the circuit will work at anything from 5 to 15-volts. 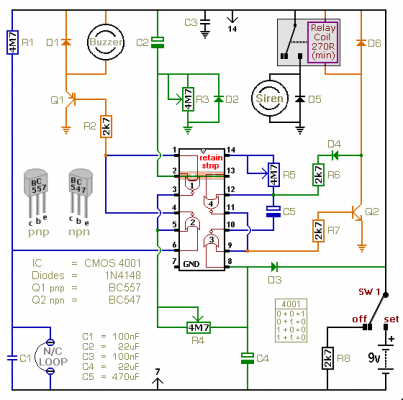 All you need do is select a Siren, Buzzer, and Relay to suit the voltage you're using. he alarm is easy to operate. Sw1 can be any type of two-way switch. If the Buzzer sounds when you switch the alarm on - the normally-closed loop is open. Switch off again - and check the building for open doors or windows. If the Buzzer does not sound - the loop is intact. Depending on the setting of R3 - you have up to about a minute to leave the building. As you do so - the Buzzer will sound. When you close the door behind you - it should stop sounding. This confirms that the loop has been restored within the time allowed. When you return and open the door - the Buzzer will sound. Depending on the setting of R4 - you have up to about a minute to switch the alarm off. If you fail to do so - the Siren will sound. Depending on the setting of R5 - the Siren will sound for up to about 20-minutes. Then it will switch off - and remain off. Of course - you can stop the noise at any time by moving Sw1 to the "off" position. For this type of device - really precise times are not necessary. If you like - you can replace the pots with fixed resistors. For example - 2M2 resistors should give you exit and entry delays of about 30-seconds - and a Siren cut-off time of about 10-minutes. 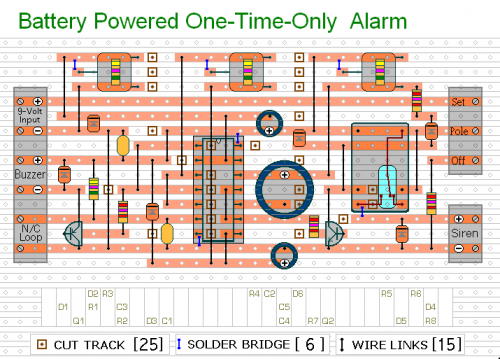 The Support Material for this alarm includes a detailed circuit description - a parts list - a step-by-step guide to construction - and more.